Although designed as an entryway repository for sandy flip-flops, these flip flop pails can also serve as ice buckets, planters, and are the absolute perfect accessories for beach theme weddings. As many of you are well aware, flip flops have replaced socks on wedding dance floors throughout the country. The issue is not whether to supply flip flops but rather how to display them in a festive, sophisticated manner befitting a wedding. When we found these adorable wedding flip flop bins on Belle & June we just had to share! They are absolutely perfect for beach theme and destination weddings. And since they are trimmed in gold, we think they would work just fine at just about any wedding. 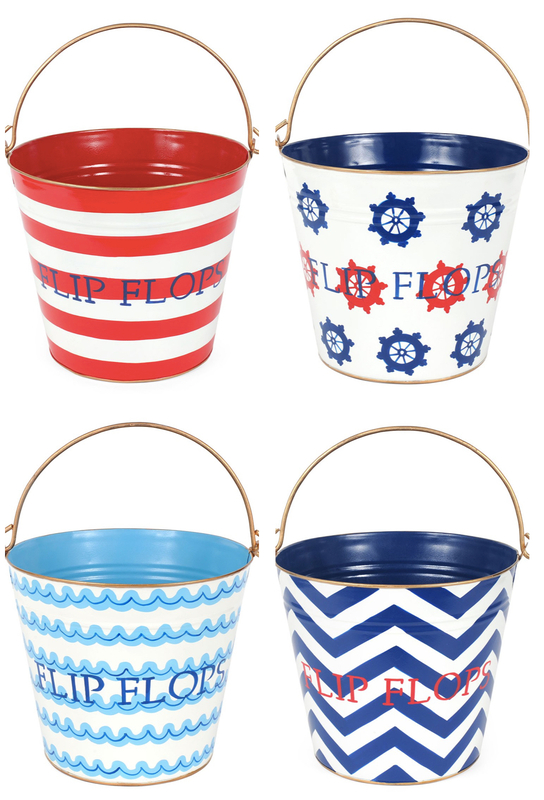 These wedding flip flop pails will add a needed touch of whimsy to even the most formal black tie affairs. These flip flop bins will work equally well at a beach theme fundraiser,Bat Mitzvah,Sweet Sixteen,Quinceanera celebration, or any party with dancing!